Q&A: Star Wars Crumbling Vehicles and Off-Topic Questions? Sure, Why Not! It's time for Q&A! Can you ask about other things here? Sure, why not. Not a lot going down with Star Wars lately. And what's the best kind of plastic for toys? Depends on who you ask, and what you need them to do. Also: ask your questions for next week! 1. Were you able to handle the Star Wars Command vehicles? If yes, were they made from PVC or from ABS? My years, limited as they may be, have taught me to shun ABS in favor of PVC; my Galoob Micro Machine ABS A-Wings have crumbled into dust, while my PVC B-Wings remain strong. If it would please you, I'd like this aside to introduce yet another query: what are your thoughts, feelings, and preferences about plastic type? You've always seemed like the type who'd actually honor a question like that. First: for those of you who just rolled your eyes, I suggest scanning this great article called "Plastic" at TFWiki.net which highlights numerous kinds of plastic, how they effect toys, and what may go wrong. Regarding the great ABS vs. PVC debate - ABS is usually more rigid and more likely to snap, while PVC tends to be a little more flexible for those who don't know - each have their place and in some lines like Outer Space Men and Transformers, each can serve a useful purpose depending on which pieces need to perform a certain function... or which tool has space for a little more piececount. I've found a great many variables over the years - I've had little breakage of any kind, but I've had PVC pieces tear on me as well. The things I hate the most are white plastic (yellows), clear colorless plastic (usually yellows), and any vac-metal chrome that isn't silver or gold since the process for reds, purples, and blues tends to flake off quite easily. Oh, and I'm super careful about red plastic because the color can (but does not always) bleed on to other lighter colors that it touches - especially white. 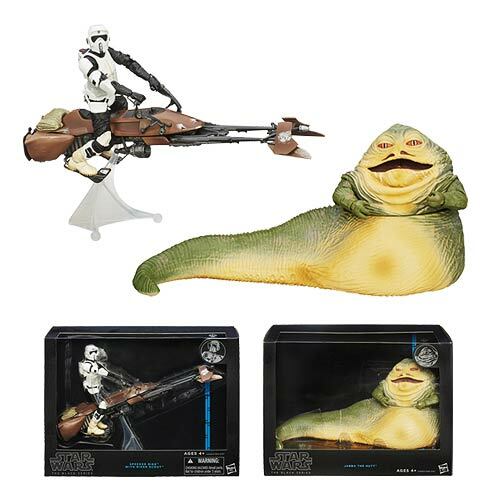 I will not pay premium pricing - or in some cases, retail price - for many white, clear, or vac-metal figures. I have not personally had a problem with gold swirly plastic, but this article highlights some real problems. I own a G2 Volt as seen in that article and have had it for years, and so far it's still in one piece. My Torca and Transmetals Megatron are also still fine so far. I just got a brand-new Masterpiece Grimlock and some red flaked off the sword hilt before I even opened the box. We've all got our various points of paranoia, and some of them are quite valid. The sad truth is time will break these items down, so in some cases you might just want to skip something now to avoid heartbreak later. 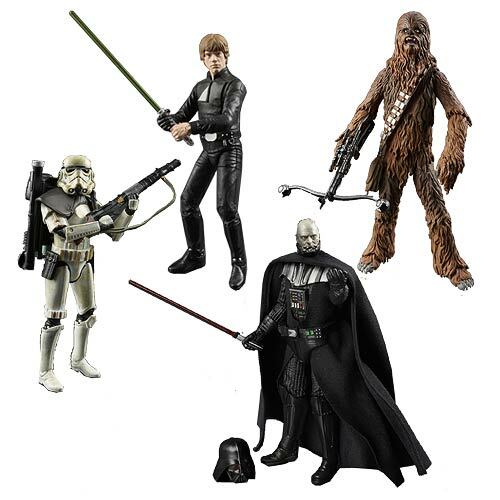 Pre-Order Your New Black Series Figures at the Links Below, and Get Free Shipping! Coming Soon to Entertainment Earth! 2.This speaks volumes about my lack of interest in Star Wars offerings these days, but...can we ask non-SW-related questions here? Good. You mentioned in a recent FOTD that there are 'rumored' (wink) Transformers Legends figures for 2014, but I've heard nothing at all about any characters other than the ones announced...can you elaborate, or are you under pain of death for speaking of such things? I will answer anything I can answer without getting fired - my day job is for a major online toy retailer/distributor, so if I do hear some things and I don't have a license to repeat them because writing this column for you guys nets me zero dollars and I want to keep eating. I think I can safely say there will be more Legends toys in to 2015 without someone shooting me - BotCon last weekend revealed images of new molds for Powerglide and Bombshell, neither of which were displayed with Micro companions. Joining them next year will be Windcharger (Tailgate retool) and Thundercracker (Starscream repaint). This year, you'll still get Nemesis Prime with Spinister and Cliffjumper with Suppressor. Mailbag's empty! Ask your questions for next week, or suffer my wrath in the form of some random editorial I've written and not yet published. This will interest three of you at best. I didn't know it but one of the many posthumous releases from Frank Zappa's estate a couple of years ago was "Carnegie Hall," a Flo & Eddie-era Mothers performance with four discs and a 47-minute version of "Billy the Mountain." (This may best be known as a roughly 25-minute song from "Just Another Band from LA," which is a long partially improvised story about a mountain going on a vacation with his wife, a tree. It's really something.) I realize the very mention of this will also cause a percentage of you to break out in hives, but I just found out about this and I'm delighted. I'm pretty sure this thing only appeals to old Zappa dorks or people who have too much of his discography on hand. One of the two new Black Series 6-inch cases has been pulled from online stores - what does this mean? Uh.... yeah. You stay tuned for that. Mysterious. Provocative. Homunculus. 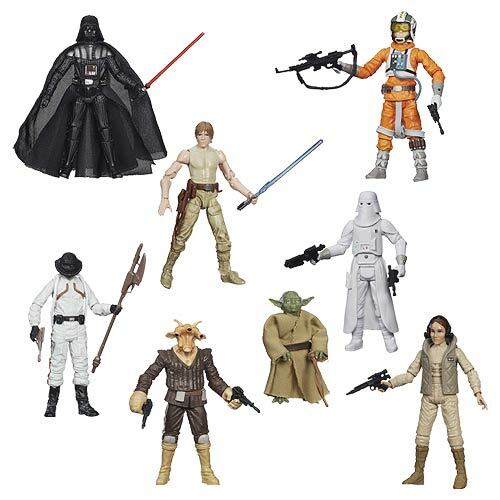 Lastly, new stuff is hitting again - most stores are downsizing their selections but I saw Luke vs. Vader and Kenobi vs. Grievous Mission Series 2-packs at Target on Sunday - so good hunting, kids. Yakface.com's own Jayson scored Yoda vs. Sidious, so it's time to hunt. The Michael Bay-produced TMNT movie toys are also hitting Walmarts, if you want to see those. Megan Fox through the funhouse mirror that is a Playmates-designed kid toy is arguably worth seeing.